This playard station is convenient and multifunctional. There is a portable travel bed, which you can use in the playard and out of it. Your baby can nap or sleep in it in part of your home, and you can keep the baby as close to you as you would like thanks to it. There is a portable changing station, that you could also put on top of the playard or locate it anywhere else. Changing diapers and clothes can be comfortable wherever you are thanks to this movable station. Extra features, like a spacious storage for wipes and diapers, and Soothing Suite Deluxe, which will provide music and vibration to soothe and entertain your baby. It's portable, it's convenient, it's great. Yet, the chances are the package you'll get will lack some parts. This is not just a playard, this is so much more. Your baby could live in it for the first few months. It is possible to nap, sleep, play in it, and you could change your baby`s diapers and clothes too. 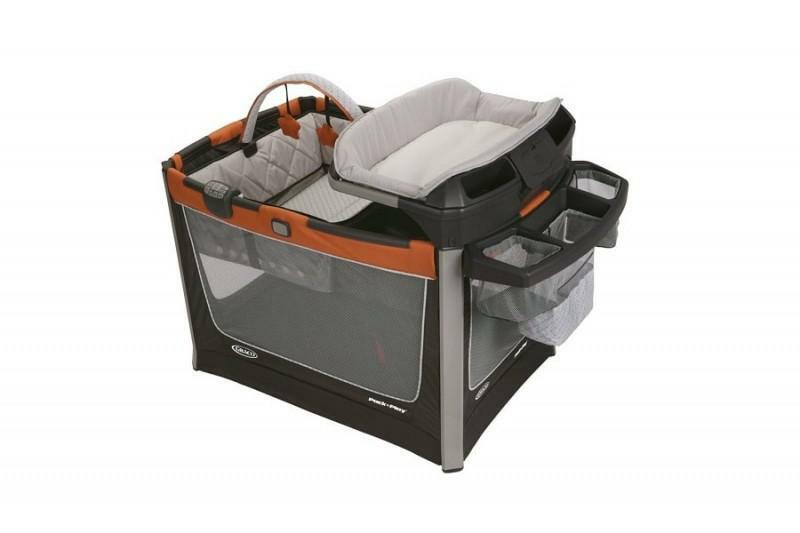 The playard itself is pretty heavy, but you can take the travel bed or the changing station anywhere you want. If you prefer to have your newborn next to you, just bring the travel bed to your bedroom. Or maybe you need to change the diaper, while being in the kitchen, use the portable changing station for it. There is no need to put a full-size baby bunk in your bedroom or run to another part of your house to change the diaper. Just turn the vibration on and calm your little one down, if your baby suffers with stomachache, toothache or bad mood. Napping and sleeping is much easier this way too. To save the batteries, there is a timer for 10, 20 or 30 minutes. There is an overhead toybar with bright toys in this set, which you an easily remove and put away or put it back any time you need to attract the attention of your baby and add some entertainment. Also, there is Soothing Suite Deluxe, which provides music and nature sounds, which are great distractions for newborns. Yes, this is a product for your baby`s comfort, but it should also be a pleasure for the parents` eyes. Graco design team made sure that this station look is simple and stylish to fit in different homes. As soon as you get your package and locate it in one of your rooms, you will immediately appreciate the design. Different colours are available. The weight is 36 pounds. The dimensions are 32 x 52 x 39.5 inches. Maximum baby weight recommendation – 33.1 Pounds. Maximum baby high recommendation – 35 inches. You will need 4 non-standard batteries for this playard. An overhead toybar with bright removable toys is included. Most customers are happy with this product and mention that its portable features were a life saver. New moms point out how convenient it is to be able to bring a changing station to any room or have a travel bed whenever you decide to pay a visit to friends and family. Fathers usually appreciate the mechanism and its simplicity. Setting this station up does not require a lot of time or effort. Some customers received the product without a detail, like a padding for the travel bed and considered it a huge problem. However, the manufacturer is always ready to make a change and provide another set that will include everything, so this should not be a big deal. In general, people find this product convenient and very helpful on a daily basis. Graco Pack ‘n Play® Playard Smart Stations is for parents who are willing to make a purchase once and use the product on as many occasions as possible. This set is multifunctional, convenient and made from high-quality materials. It is not as portable, as some other playards on the market, but it includes numerous tools, such as a portable changing station and a portable bed. Q: Is a mattress included? A: Yes, there is a mattress included in this set that you can use for the bassinet and the bottom of the Pack N’ Play. Q: Does this playard have wheels on it? A: No, it does not have any wheels. Q: When should we stop using the changing table? A: After your baby`s weight becomes more than 30 pounds. A happy mother of two, a pediatrician with 7 years' experience, a successful entrepreneur and a self-confident woman.